Italian became prominent during the 11th–16th centuries, when artistic development in Italy was at its peak. Cities such as Palermo, Venice, Milan, Naples, Florence and Vicenza started to produce luxury goods, hats, cosmetics, jewelry and rich fabrics. The north part of italy is normally cold in winter and warm and humid in summer . Cities located on a higher altitude are more windy and cold, but you can enjoy a summer heat, thanks to the sun. The south part of italy is characterized for being warmer, year-round. In many areas, it doesn’t even snow! Rome and the south are very hot in the summer 35°C/95°F (May-September), but it can be enjoyable due to sea breeze. Winters are warmer and not as cold, with better weather than in the north. It is important to make a good impression at an interview. Dress neatly, formally and to the latest italian fashion. It is conceived to be a sign that you will also pay attention to your work. Dress elegantly but conservatively. Dress and presentation plays an important role in Italian culture. Fashionable style is considered a sign of wealthy social status and success. Milan is one of the World’s four main centres of fashion and Italian design and craftsmanship is valued, respected and coveted the world over. Anything that is ‘made in Italy’ has a tremendous cachet and respect. Prada, Marni, Max Mara, Armani, Dolce and Gabbana. Missoni and Gucci are just some high fashion Italian brands. In general, the characteristics of elegance are quality fabric dresses, such as lightweight wools and silk. Quite often, great attention is given to fashionable brand clothing and accessories. Formal attire is generally expected for business meetings, for the most part dark colours for businessmen. Businesswomen tend to wear elegant and modest pant or skirt suits, accessorized with simple jewellery and makeup. 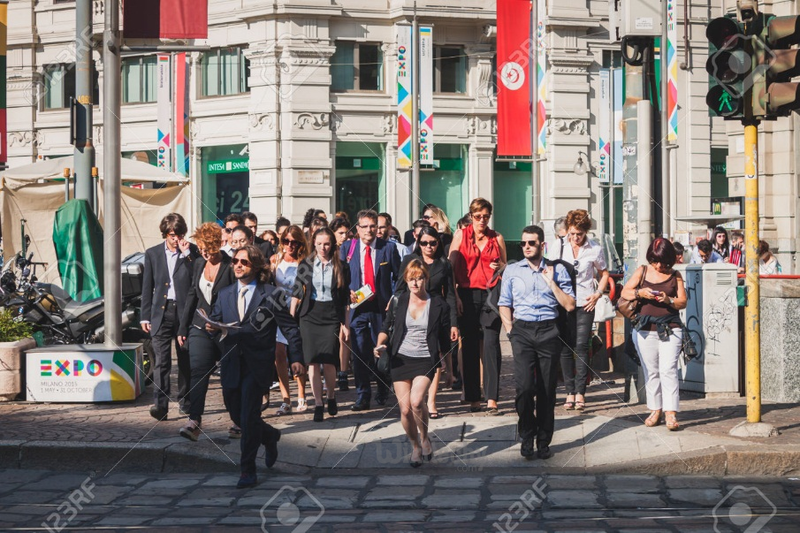 While a conservative style is always accepted, more informal clothing is also common, especially outside of large companies and financial circles. To be on the safe side it is recommended to adopt tasteful coordinated clothes and to refrain from “competing” on fashion details if you are not particularly interested in such things. 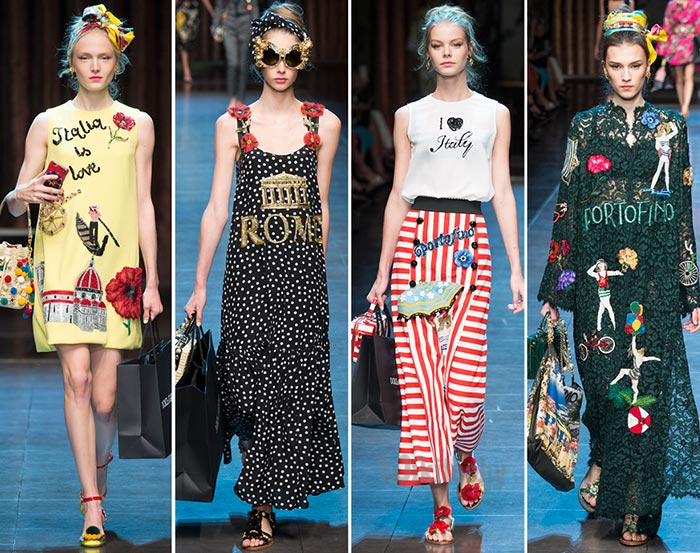 Keep in mind that Italy is a major center of European fashion design and production. Even casual clothes are smart and chic. In Italy, each region has a traditional costume, however, nowadays, people only wear traditional costume during special celebrations (these are often agricultural festivals such as the end of the harvest season) and historical parades. Traditionally a woman’s costume consists of a long, wide dress, which must cover her ankles.This is worn with a tight bodice and a short a small waistcoat. Women usually wear a cap or a veil too. The fabric used and also the colour of the bodice and dress may denote the region she is from and also her status. Costumes made of silk were very common in Lombardia where the silk industry has flourished since the 16th Century.In the South, costumes were made out of wool or orbace as it is called in Sardinia. Traditional men´s costumes were less elaborate.Usually consisting of tight pants tucked inside long boots. White trousers dirtied easily and were, in the past, difficult to clean, so white pants were worn only on special days when farmers did not work, or worn by more affluent men who did not work on the land. They also wore a shirt with a tight waistcoat, often a vest or a jacket and a hat. Italy hats - The shape of the hat depended on the region. In the North people wore harder, more rigid hats, whereas, in the South, people wore a softer one such as a berretta. Nowadays, however people dress much more casually. Italy is famous all around the world for its fashion and style and tourists from all over come to shop and visit famous boutiques in Rome and Milan (such as Versace, Dolce & Gabbana, Armani and many others). italian fashion is not just a hobby for wealthy people since you can find some great clothes at street markets too. Sometimes real treasures can be found among the vendors of Porta Portese, a Sunday street market in Rome or La Montagnola (the Friday/ Saturday street market in Bologna) Also, these days, many second hand shops specialize in vintage clothing. Although many regions within Italy have traditional italian clothing reflective of that area's history and traditions, there is no official national costume of Italy. This is possibly because Italy, as the country as it is known now, is relatively young. Prior to unifying as a nation in the middle of the 19th century, the country known as Italy was comprised of several different city-states. The traditional dress of many of the regions of Italy reflects those individual histories rather than a unified national history. Because there are certain elements that the regional traditional costumes share, they are often merged to represent a single look. 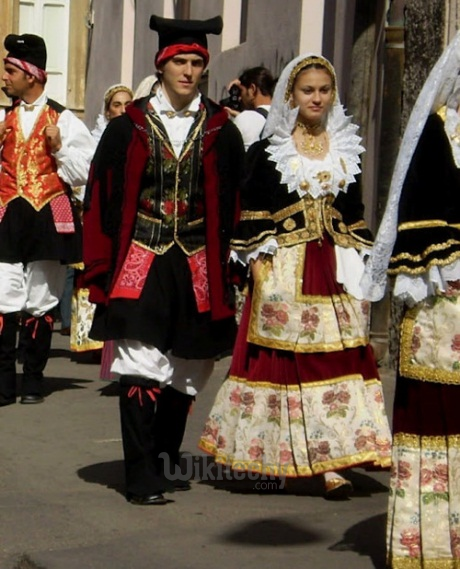 Most regional costumes, for instance, are comprised of brightly colored skirts, a corset over a white blouse or shirt and an apron made of lace or embroidered fabric, which is indicative of many parts of Italy. Accessories, such as head pieces or shoes, may vary slightly from region to region. Many depictions of traditional Italian costumes depict the country's famous red, white and green national colors. Women generally dress modestly in Italy. This is especially true for the italian clothing that both women and men wear to places such as churches and museums, which often require a specific type of dress. When visiting places such as these, women in Italy refrain from wearing shorts, bear arms, low-cut dresses and short skirts. Capri pants and cotton slacks are often worn as alternatives. Italian women typically wear simple makeup and soft shades of lipstick and nail polish. Men also refrain from wearing shorts, bear arms and tank tops in churches and museums. In conservative locations in southern Italy, women are typically expected to wear a shawl or head scarf when visiting a church. Jeans are also worn in Italy as long as they are neat and in good condition. They are typically paired with a pressed sports shirt for men or a blouse for women. Italian women - women always wear make-up (usually the kind of make-up that looks very natural) and have their hair, eyebrows and nails done (especially toe nails), but they hardly wear perfume. Italian women - you can wear jeans (even in more formal situations), as long as they are combined with an elegant jacket or stylish accessories. They should be well-fitting and stylish. Never ever wear a tie with jeans, though. Italian men - men always wear socks in closed shoes. The only exception to this are moccasin-style shoes or yachting shoes, but even here Italians will usually wear a type of socks specifically adapted to this kind of shoes, called fantasmini ('invisible' or very short socks). Italian men - men wearing a suit should know that shirts without brest pockets and collar buttons are considered more elegant. Odd dressing - NOT by some specific attires, such as a tie. Wearing a tie on a jeans or an unperfectly ironed shirt is worse than wearing no tie in a classy suit. The first thing Italians will look at are your shoes and then the quality of the fabrics, rather than what they represent. - (remember that in Italy everything is possible fashion-wise. These dont's are only intended for travelers who prefer to remain on the safe side). - avoid sweat suits or sports shoes in the city, except if you are doing sports. The only exception to this are very stylish, branded sports shoes, but these are usually not flashy and should always look VERY new. - no tank tops or other shoulder-less clothing in churches or sacred places. It is always a good idea to cover up your shoulders when entering a church. Entering a sacred place with sleeveless or shoulder-less clothing may be interpreted as an insult to the sacred. - no oversized shirts or baggy trousers. Italians always wear appropriately sized italian clothing (younger Italians even like to dress slightly smaller than their actual size). - no fanny packs or belt packs. - no over-sized T-shirts, especially not those with big, flashy pictures on them. - no extra short shorts for men (especially the sports type), unless you are heading to the beach or vacationing in a beach resort and even then prefer them longer (knee-level, bermuda shorts type). An absolute no-no are running shorts or wearing shorts in the evening ! Also avoid wearing socks with shorts. - no flip-flops or thongs in the bigger cities (this is a tricky one, because some thongs can look really elegant, so it does a little depend on the type). - no open shoes for men in the evening (unless, maybe, in a beach resort). - a big NO-NO are white socks with trousers ! Socks should always be as discrete as possible, preferably black or blend in either with the color of the trousers or that of the shoes. White socks are for sports only! - no short-sleeved shirts for men in more formal places. An absolute no-no is a tie with short-sleeved shirts ! Summer shirts (made of thinner cotton or flax) are OK in all occasions, but not with a tie ! A tie always requires a shirt with a hard, well-defined collar. - no bright, flashy colors. Italians do wear bright colors, but in specific combinations and not at all times. Some colors that are typically very popular in some countries look very strange to Italians as colors for clothes, such as mustard yellow, petrol blue, bottle green and dull bordeaux red. In case of doubt and to remain on the safe side, prefer earthy tones, or black, marine blue, cream and white. - Some red and other stronger colors are fine, but too much red, purple or flashy color combinations may soon look out of place. - Pastel colors such as lilac, pastel green, pastel rose and salmon are best reserved for the Summer. - The only exception to this are all shades of beige, camel, broken white, ivory and cream white and grey which can be worn all year round.